Digital Photography – A paradigm shift in the way we capture images. So much easier to take and store hundreds of images. Red Sox – Game 1 against the Yankmees and they can’t even score a single blasted run. Wake up, Boys. We need this series. Verizon EVDO Rev A. – More than twice as fast. Summertime – One more month to go. Summertime – Only one more month to go. This guy is becoming less skittish and will even pose a bit. Another Saturday afternoon of baseball ruined by Fox Sports. Denying Americans their right to enjoy watching their favorite baseball team play on a Saturday afternoon is not only despicable, it’s un-American. I pay for MLB.com and I get Fox stations here at home. Despite having two ways to access the game, I don’t get to see it because of Fox’s money-grubbing dictatorship and MLB’s capitulation (no doubt also greed-based) in the face of the mighty Fox Sports exec’s demands for nationwide blackout. This is not “fair” or “balanced.” It’s just despicable. Typical Fox Sports. Margaritas – Perfect on a 90 degree day. Red Sox – Out on the West Coast for another road trip. Downright embarrassing game tonight. TB won, so the Sox are back in 2nd place. Skype – Seems to work pretty well, even when conferencing with several land lines. National 55 MPH speed limit- We’ve been down that road before. It was stupid then, it’s stupid now. BMW’s Ultimate Test Drive – Had a ball driving some awesome cars this past Monday. Great way to raise money and awareness for breast cancer research, too. No, this isn’t another book review. Just another visit from the Fox family. This little guy was barely bigger than a chihuahua. He liked the peanuts, though. Although the squirrels weren’t too happy about his visit. 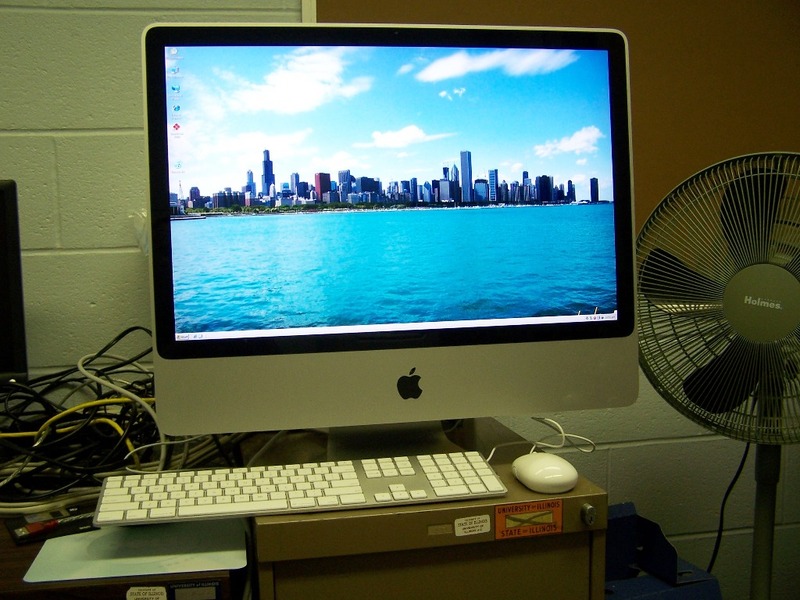 Apple iMac – We bought 5 of them (24″) at the office. Sweet machines that run Apple OS X and Windows XP faster than a dedicated Windows box. Red Sox – They swept the Twins while the Yankmees were sweeping the Rays to gain back 3 games, but when they had a chance tonight to gain another game and pull to within a half game, they suddenly forgot how to hit. Or maybe they used up all their offense in Wednesday’s 23 hit rout. Noise at the office – This week they were jackhammering the back stairs, demolishing the old library area, and cutting/scraping up the concrete road surface out in front of the building. At times you couldn’t hear yourself think. Yet another 3-day weekend – Well, sort of. Monday is the Susan G. Komen foundation BMW Ultimate Test Drive at Isringhausen Imports in Springfield. I’m scheduled to drive a very nice Alpina B7 and a Z4. In the past, they’ve had enough free time slots available to allow you to drive anything you want, so I’m also looking forward to driving a new M3 and maybe a 135i. Amazon’s “Free” Shipping – You don’t pay extra for it, so in the strictest sense of the word it’s free, but if time is money, their free shipping is plenty expensive. I ordered a pair of sunglass last Friday and they supposedly shipped on Tuesday from a town in MO that is only 110 miles from my house. I still haven’t received them. Amazon claims they’ll arrive on Monday. So almost a week to travel 110 miles. Next time I’ll pay the extra 2 or 3 bucks, but I suppose that’s exactly why they make the free shipping so painfully slow in the first place. Update: I just found out that despite Amazon’s email notifying me that my glasses “shipped” on the 8th, they didn’t actually make it to the post office until today. I suspect they were packaged on the 8th and not picked up by USPS until today. Alan Furst has a rare and amazing talent that enables a reader to experience the locations in the book with all the senses. His writing is compact, yet his economy of words only increases the sense of being there. I have been to the Brasserie Heininger many times with many different characters. I have smelled the cigarette smoke and I have heard the raucous laughter. I have marveled at the bullet hole in the mirror behind table 14 and have enjoyed several meals, all courtesy of this gifted author. And as always I leave that fine establishment as I leave all of his novels; hungry for more and looking forward to my next visit. Start with any of his books and read them in any order. You will find yourself returning to familiar places with new people, and occasionally you’ll bump into those people again in another story. Such is the joy of reading Furst. It’s like being on the A-List in late 1930’s Europe, when everyone knew trouble was brewing and did their very best to find distractions. You’re always in the middle of the excitement with the most interesting people. Argh. Faux Sports, the world’s WORST sports network, has the rights to today’s Red Sox/Yankmees game and the Cubs game. Since the Cubs are the local team, I don’t get to see the Sox on Fox. And since MLB caved in to Fox’s ridiculous demands for a nationwide blackout, I don’t get to see it on MLB.com either. Wonderful. Faux Sports screws up Formula One coverage, they insult the intelligence of all baseball fans by adding in their moronic sound “supplements” such as the ball striking the catcher’s mitt, and now they’re screwing up Red Sox coverage for fans outside the normal Sox viewing area. I fail to understand how or why it’s economically advantageous for them to do a really poor job covering sporting events, yet they seem to be making money at it. Go figure. Independence Day – Nice having it on a Friday. Red Sox – They’ve taken two in a row against the Yankmees in the Bronx, so that’s a good sign, but their 5 game losing streak earlier this week changed the whole AL East race for the worse. They’re going to have to stay sharp just to keep pace with TB. Doldrums – We’ve been back from our vacation for almost two weeks now and I can’t seem to find the energy to get some pictures posted or even write about it. Alan Furst – His latest book is excellent. Review to follow (Doldrums notwithstanding). Coles County Fireworks Display – Lamest show ever. But at least it was mercifully short.